Morphine is a potent opiate analgesic medication and is considered to be the prototypical opioid. It was first isolated in 1804 by Friedrich Sertürner, first distributed by same in 1817, and first commercially sold by Merck in 1827, which at the time was a single small chemists' shop. It was more widely used after the invention of the hypodermic needle in 1857. It took its name from the Greek god of dreams Morpheus. An opium-based elixir has been ascribed to alchemists of Byzantine times, but the specific formula was supposedly lost during the Ottoman conquest of Constantinople (Istanbul). Around 1522, Paracelsus made reference to an opium-based elixir that he called laudanum from the Latin word laudare, meaning "to praise." He described it as a potent painkiller, but recommended that it be used sparingly. In the late eighteenth century, when the East India Company gained a direct interest in the opium trade through India, another opiate recipe called laudanum became very popular among physicians and their patients. Morphine was discovered as the first active alkaloid extracted from the opium poppy plant in December 1804 in Paderborn, Germany, by Friedrich Sertürner. The drug was first marketed to the general public by Sertürner and Company in 1817 as an analgesic, and also as a treatment for opium and alcohol addiction. Commercial production began in Darmstadt, Germany in 1827 by the pharmacy that became the pharmaceutical compary Merck, with morphine sales being a large part of their early growth. Later it was found that morphine was more addictive than either alcohol or opium, and its extensive use during the American Civil War allegedly resulted in over 400,000 This idea has been a subject of controversy, as there have been suggestions that such a disease was in fact a fabrication; the first documented use of the phrase "soldier's disease" was in 1915. Diacetylmorphine (better known as heroin) was synthesized from morphine in 1874 and brought to market by Bayer in 1898. Heroin is approximately 1.5 to 2 times more potent than morphine weight for weight. Due to the lipid solubility of diacetylmorphine, it is able to cross the blood-brain barrier faster than morphine, subsequently increasing the reinforcing component of addiction. Using a variety of subjective and objective measures, one study estimated the relative potency of heroin to morphine administered intravenously to post-addicts to be 1.80–2.66 mg of morphine sulfate to 1 mg of diamorphine hydrochloride (heroin). Morphine became a controlled substance in the US under the Harrison Narcotics Tax Act of 1914, and possession without a prescription in the US is a criminal offense. Morphine was the most commonly abused narcotic analgesic in the world until heroin was synthesized and came into use. Until the synthesis of dihydromorphine (ca. 1900), the dihydromorphinone class of opioids (1920s), and oxycodone (1916) and similar drugs, there generally were no other drugs in the same efficacy range as opium, morphine, and heroin, with synthetics still several years away (pethidine was invented in Germany in 1937) and opioid agonists amongst the semi-synthetics were analogues and derivatives of codeine such as dihydrocodeine (Paracodin), ethylmorphine (Dionine), and benzylmorphine (Peronine). Even today, morphine is the most sought after prescription narcotic by heroin addicts when heroin is scarce, all other things being equal; local conditions and user preference may cause hydromorphone, oxymorphone, high-dose oxycodone, or methadone as well as dextromoramide in specific instances such as 1970s Australia, to top that particular list. The stop-gap drugs used by the largest absolute number of heroin addicts is probably codeine, with significant use also of dihydrocodeine, poppy straw derivatives like poppy pod and poppy seed tea, propoxyphene, and tramadol. The structural formula of morphine was determined by 1925. At least three methods of total synthesis of morphine from starting materials such as coal tar and petroleum distillates have been patented, the first of which was announced in 1952, by Dr. Marshall D. Gates, Jr. at the University of Rochester. 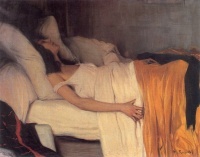 Still, the vast majority of morphine is derived from the opium poppy by either the traditional method of gathering latex from the scored, unripe pods of the poppy, or processes using poppy straw, the dried pods and stems of the plant, the most widespread of which was invented in Hungary in 1925 and announced in 1930 by the chemist János Kábay. In 2003, there was discovery of endogenous morphine occurring naturally in the human body. Thirty years of speculation were made on this subject because there was a receptor that apparently only reacted to morphine: the mu3 opiate receptor in human tissue. Human cells that form in reaction to cancerous neuroblastoma cells have been found to contain trace amounts of endogenous morphine. The withdrawal symptoms associated with morphine addiction are usually experienced shortly before the time of the next scheduled dose, sometimes within as early as a few hours (usually between 6-12 hours) after the last administration. Early symptoms include watery eyes, insomnia, diarrhea, runny nose, yawning, dysphoria, and sweating and in some cases a strong drug craving. Restlessness, irritability, loss of appetite, body aches, severe abdominal pain, nausea and vomiting, tremors, and even stronger and more intense drug craving appear as the syndrome progresses. Severe depression and vomiting are very common. The heart rate and blood pressure are elevated and can lead to a heart attack, blot clot or stroke. Chills or cold flashes with goose bumps ("cold turkey") alternating with flushing (hot flashes), kicking movements of the legs and excessive sweating are also characteristic symptoms. Severe pains in the bones and muscles of the back and extremities occur, as do muscle spasms. At any point during this process, a suitable narcotic can be administered that will dramatically reverse the withdrawal symptoms. Major withdrawal symptoms peak between 48 and 96 hours after the last dose and subside after about 8 to 12 days. Sudden withdrawal by heavily dependent users who are in poor health is very rarely fatal. Morphine withdrawal is considered less dangerous than alcohol, barbiturate, or benzodiazepine withdrawal. The psychological dependence associated with morphine addiction is complex and protracted. Long after the physical need for morphine has passed, the addict will usually continue to think and talk about the use of morphine (or other drugs) and feel strange or overwhelmed coping with daily activities without being under the influence of morphine. Psychological withdrawal from morphine is a very long and painful process. Addicts often suffer severe depression, anxiety, insomnia, mood swings, amnesia (forgetfulness), low self-esteem, confusion, paranoia, and other psychological disorders. The psychological dependence on morphine can, and usually does, last a lifetime. There is a high probability that relapse will occur after morphine withdrawal when neither the physical environment nor the behavioral motivators that contributed to the abuse have been altered. Testimony to morphine's addictive and reinforcing nature is its relapse rate. Abusers of morphine (and heroin), have the highest relapse rates among all drug users, including abusers of other opioids, cocaine, and methamphetamine. A complication that may arise from long term morphine use or abuse is neurotoxicity. Morphine is more often associated with nightmares where oxycodone is not. It is not fully understood yet exactly how morphine may cause neurotoxicity. Morphine neurotoxicity, such as delirium, resolves when rotating from morphine to oxycodone. Oxycodone neurological side effects are more cognitive than motor (myoclonus) and hallucinations are reported less frequently with oxycodone than with morphine. It is possible that these effects arise from the stronger binding affinity of morphine to Kappa receptors than oxycodone. Unless indicated otherwise, the text in this article is either based on Wikipedia article "Morphine" or another language Wikipedia page thereof used under the terms of the GNU Free Documentation License; or on original research by Jahsonic and friends. See Art and Popular Culture's copyright notice. This page was last modified 09:45, 6 November 2016.